With incredible power-to-weight, the 3.4-liter XKSS maintained the D-Types performance with a top speed approaching 150 mph, 0-60 acceleration under 6 seconds, and 100 mph reached in just over 13 seconds. Unfortunately, only 16 cars were completed when a fire broke out at Jaguars Browns Lane works on February 12 1957, destroying the remaining nine cars, plus their jigs and tooling. Two other D-Types, XKD 533 and XKD 540, would later be converted by the works to XKSS specification as well. With its Le Mans pedigree, high performance and shapely body, the XKSS quickly became a favorite of wealthy enthusiasts and top stars including Steve McQueen, who terrorized Hollywood with his beloved XKSS. In turn, their extreme rarity and desirability have created demand far exceeding availability. 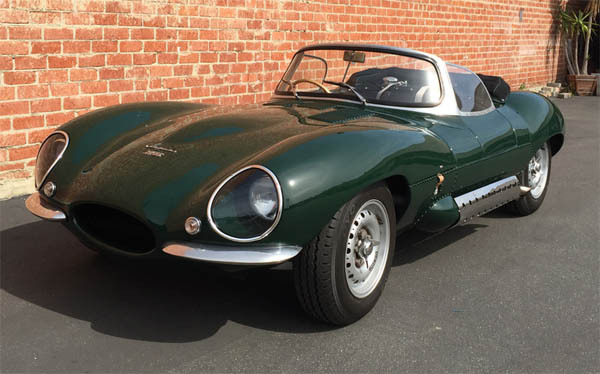 The vehicle offered here is an outstanding XKSS recreation, originally one of 12 built by Revival Motorsports as a D-type race car for a racing series in Britain. Components were supplied by Realm Engineering. The chassis is a Reynard competition unit, utilizing a Jaguar double-wishbone setup with torsion bars up front, a Jaguar independent rear suspension with disc brakes all around, inboard at the rear. Restored in 2011 from the ground up, the car was fitted with a new Tremec 5-speed transmission and a 1969-vintage 4.2-litre motor, fully balanced and equipped with a forged crankshaft, lightweight steel connecting rods, and forged high-compression pistons. The new cylinder head was machined to accept larger valves, updated springs, and lighter cam buckets. True to form with its triple Weber 45DCOE carbs and running with relatively mild 9:1 compression, the engine is docile enough for road use while retaining its competition heritage with 305 horsepower on tap. Bodywork is cutting-edge Kevlar composite and fiberglass, with panels supplied by Realm Engineering.